The 2017 GAMA Trade Show was an absolute blast to attend. I got to spend half the week with my wife along for the ride, and the entire week with a business partner as focused on work as I was, as opposed to my previous business partner whose primary objective at GAMA 2016 was to party. That's fine, it's Las Vegas, we understand that merriment is within easy reach. But I am more interested in making money in the long haul than I am in tasty beverages today. Net Income was the recurring theme of the show, and is the recurring theme of my 2017. The various publishers have already released their GAMA news to the general public, and some of it was pretty prominent stuff, such as the TCGPlayer Pro launch. Rather than recapping that, I wanted to round up some of my business thoughts and impressions and some things that stuck in my mind afterward. Paul Simer and I presented "Video Games? In My Game Store?" as a seminar introducing tabletop stores to the category. Our first showing was packed with my own in-state competition, so I'm sure some of them will make a go of it. And it actually doesn't matter! The category is just that wide. The typical poaching and rivalry that comes with the tabletop territory is barely relevant here. For all those who audited our seminar, I hope you do well with video games if you dive in. I visited WPG's locations no less than three times (East twice) and absorbed the wisdom and guidance of its proprietor, Mickey Tenney. This is a gentleman who has it dialed in. Nobody had to tell him that net income was the real goal. Last year, he and Paul taught me how to get back into the video game category properly. This year, Mickey showed me what he was doing at the next level. Maybe ten or fifteen process advancements that I wasn't ready for last year and still won't fully implement until later this year. But a couple of them are going to happen quickly. I have much to do and that's two I owe Mick for showing me the way. My other seminar paired me with theater adept John Stephens from Total Escape Games in Broomfield, Colorado. We taught the use of the SWOT tool for competitive edge in markets where pop-up stores seem to appear one after the next. I had a lot of local competitors in this seminar as well, so hopefully they weren't paying that much attention. Games Workshop sent in the Necron Monolith with their new Trade Terms announcement: effective May 3rd, a Minimum Advertised Price of 85% of MSRP, coupled with permission to sell online via web shopping carts and third parties at instant purchase prices only, no auctions. I could scarcely have been happier. I will be required to raise my prices, since my local market is extremely competitive and a 20% blanket discount had been a necessary tool these last few months. This will mean somewhat healthier sales moving forward, as well as a lot of eleventh-hour buys on or just before May 2nd. It will be great to add Warhammer to the list of brands where my customers are able to shop from their phones from our store website and pick up in-store after work, as many Magic, Pokemon, and Fantasy Flight players have already been doing. The RuneWars minis game that Fantasy Flight is about to release was laid out for demo and looked pretty stunning. I don't know how it's going to do, but I admire the question. I backed the Kickstarter of the upcoming miniatures tabletop adaptation of Dark Souls. The buzz and hype around this title is unreal; distribution is sold out and it will surely follow Gloomhaven as the late spring's unobtainium title. Everyone wants it and everyone who didn't back it wishes that they had. I don't back many Kickstarters, but this was one that seemed like a worthwhile risk. Also, Cool Mini or Not, now christened simply "CMON," announced plans to use Kickstarter as their pre-order vector for new core games, after which successful titles will see expansions routed entirely through distribution. For years, Kickstarter has been a problem. Can Kickstarter now be a solution? We shall see. Every Vegas trip requires a stop at this eatery, and not just because the liquor store next door has a 99-year lease. (Did you know they had a 99-year lease? They do! 99 years. Just so you know.) Battista's is one of those places with a 20-item menu that's painted right on the walls, minestrone or salad with every meal, as well as unlimited wine and garlic bread and a cappuccino to finish it off. Their lasagna has the density of the black hole at Messier 31 in the Andromeda Galaxy. Their Chicken Rio was good enough for Griffin to order it thrice in one week. John Stephens and Dawn Studebaker join the returning David Steltenkamp on the GAMA Retail Division Board. For some reason Travis Severance got the chair again, which I can only assume is a result of the institutional rank conferred by his additional tattoos. Congratulations all! Wizards of the Coast does not do much at GAMA anymore, just a few publisher workshops oriented toward neophyte stores. They do not have a presence in the exhibit hall anymore. I got to catch up with DeQuan Watson from WOTC, and of course he graciously deflected my relentless attempts to elicit cardlists for Eternal Masters 2: Electric Boogaloo. I got a call shortly afterward that the mothership wants to do some marketing with DSG this summer, to which I quickly agreed. I got to meet some of the mega-scale Magic e-tailers who have given me valuable guidance and instruction to getting DSG to where it is today. Without exception they were a pleasure to meet in person and I look forward to a long future of mutual regard. TCGPlayer Pro is going to be big, and the room howled in approval (including yours truly). Many foretold the doom of Crystal Commerce as a consequence, only to discover that the Pro pie isn't quite fully baked yet, and will need more time in the oven before it becomes a widespread and versatile tool as envisioned. Given its shorter-than-short development time, this is understandable. Meanwhile, Crystal Commerce themselves presented a peek into their platform's future that moves in a somewhat different direction but is still extremely relevant. Moving to a new application core will break some existing utilities and require upgrades, and it took a moment before Dan McCarty realized to assure us we wouldn't be charged for it. Chedy Hampson's pitch for Pro was somewhat more polished, and I know the room responded to that, but I would join Simer in cautioning others to look before leaping. But to be sure: TCG Pro made a splash. You know something significant just happened in this space when the next couple of guys you talk to about it are Jim Sorel and Michael Caffrey and they both ask you what you think is going to happen with the new platform. I felt particularly sympathetic to Andrew Zorowitz, the Convention Tycoon, whose Crystal Commerce / TCGPlayer deployment was hours old at the time of the TCG Pro announcement and everything going sideways. Fortunately, he is making us Tarmogoyf Dice, which will accrue to him much esteem. 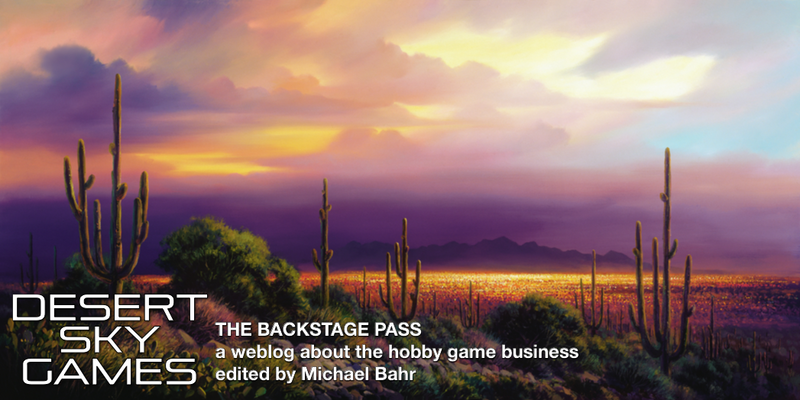 We stopped on our way north at Game On Arizona, Josh Fohrman's huge mall store at the Prescott Gateway Center. The main public store is one of the largest in the state, possibly the largest overall at just under 6,000 square feet, and their backstage area is gigantic. The main store carries all the things you'd expect to see, but stands out due to some canny merchandising with Coldwater Creek's second-hand fixture buildout, and excellent signage throughout the facility. DSG Chandler/Gilbert will give us an opportunity later this year to follow Fohrman's example. It appears we were not the only ones impressed by Game On. They also won the GAMA Outstanding Store of the Year Award for 2017. So, you know, they possess some modicum of quality. I have spoken about how strong Pokemon has been lately for me, and it appears I am not alone. Mickey, mentioned earlier, was just one of several retailers who told me Pokemon was topping his sales charts now. The 20th Anniversary was a hit, the Go mobile game is still being played by a few people at least, and the Sun & Moon series has been well received. I really hope TCGPlayer adds Pokemon to its Direct program. In any event, I have called for my staff to hard pivot to getting our Pokemon cards prioritized for additional listing. Adding floors above and below one's store seemed to be the order of the year for 2016-2017. At GAMA we had Travis Parry's The Nerd Store and John Coviello's Little Shop of Magic existing in the land of the Other Floors, joining such great establishments as Greg May's The Uncommons and Laura Martin's Meeples Games. Meanwhile, Gary Ray built himself a loft bungalow and then ditched out on us to spend time penning his memoirs. Adding floors is usually a big "screw that" in Phoenix, so I don't think this trend will quite reach us here at DSG. I can't drink beer due to bariatric surgery from 2012, so this eatery is limited in its impact on me. Everyone else has a rollicking good time at the best Biergarten within range of the Strip. I just have to content myself with the best of their wurst. Ja, is gut. God help me, I thought I was done with this category. And then they pull me back in. I saw board games with potential from a broad slate of publishers, from WizKids to Renegade to Iello. A new (to me) publisher called Smart Toys and Games had a substantial spread of educational games that I would have snapped up in an instant if I already had a mall store open. I will proceed with caution. Board games is a category I loved that didn't love me back. We will see what the future holds. John Coviello's upstairs mezzanine store, now four times its previous size, give or take, has already hosted a bunch of Regionals that my local players traveled to play. The converted office complex seeks to add coffee service in the near future (its location taped out on the floor) and already affords ample room to product and events. Their broadcast room, optimized for streaming shows, is an especially nice touch. It's no accident they have survived and thrived since opening in Flagstaff, Arizona in 1994. It's real! I couldn't believe it! So certain I was that this odd-branded orange-striped Circle K had to be some manner of impostor, but when I walked in, the familiar rounded strikeout emblem was everywhere. And as if on cue, multiple Circle K stores locally in the Valley have just rolled out the new branding as well. Surreal. Like when you were a kid and your family was on vacation in another town and Robotech came on at 4:00 p.m. instead of 4:30. There isn't a nicer guy in the game trade than Steve Ellis. Unless it's Gordon Johansen, and we get to have two nicest guys because of the exchange rate. I was not especially alert to comics this time out, and Diamond did not have a presence that I noticed. Our comics business has normalized to a slow but steady burn lately and I am content to sit back and monitor that from orbit. One of the phrases of the week at GAMA, referring to when you buy a card or game from someone and sell it back to them shortly afterward. On balance I'd actually rather not do this. But it happens. When a customer wants to sell me things, I am not in favor of saying "no." Nate Petersen had the most excruciating week ever. Rumors swirled about that TCGPlayer was going to announce a point-of-sale solution, which could have crushed IMP POS in the cradle and put the waste to over a year of Nate's work. At the presentation, he was sweating it good, one Powerpoint slide away from witnessing his own mortality. And then... life! Not just alive, but kicking! TCGPlayer left it to the programming community to build the front-end apps that would manage their new e-commerce beast. They couldn't have handed it to him more clearly if they had issued an engraved invitation. Crystal Commerce is in the pole position, but let nobody be mistaken: Nate's IMP is going to be the app of choice for more than a few TCG resellers. I imagine Nate will be busy for a while. I met and/or caught up with (as applicable) a lot of the people I hoped, but did not manage to visit with Scott Gaeta, Michael Webb, Paul Butler, or Bryan Winter this time out. Next time I hope! Articles like this are a tough write because I could just drop names all day and I still would leave some out without meaning to. Like Josh Petrik or Chad Suico. I placed a rather large order with Norse Foundry for some gemstone dice, since they sold out readily last year and restocks were pretty slim to come by. Not many people buy $80 sets of polyhedrals, but for that person who wants such a thing, they really want it, and no substitute will suffice. A second dice offering called Halfsies got our attention, but they were sold out and we had to contribute our business card for later. Ultra-Pro was there as always pushing sleeves, and obviously we will be carrying some amount of that in perpetuity, but they were aligned with the degenerates from Unrivaled, and that puts a stain on their name as far as the general game retailer community is concerned. Enthusiasm level = down. Crit Success Rings was there again and as usual I didn't get around to ordering six hundred units like I keep meaning to do. Do you want cheese and bacon omelettes for two meals a day? I do. Bally's is connected to the Paris by tunnel, and so it went. I'm pretty sure Paul Simer carried one of everything in that shoulder/belt pack. I saw multiple flashlights. I was aware of multiple firearms. I used the hand sanitizer. If he is anything like my friend Eldon Palmer, he found some way to stash a spare patrol car in there. One of the highest EV plays at the GAMA Trade Show is to network in the retailer lounge with peers. Even if it's to do nothing but commiserate at our shared frustrations, the catharsis is exquisite and the opportunities to learn from others are plentiful. Amusing things happen as well, such as when random drunks stumble into the room and we feel obligated to start teaching them how to improve their organized play programs. The next three GAMA Trade Shows at minimum will occur at the Peppermill Hotel in Reno, rather than in Las Vegas. I have never been to the greater Lake Tahoe area and next March's show will be a new experience for me. My other business partner isn't a fan of the Peppermill, but I don't know whether that reflects some shortcoming as a resort location or whether he has been to a trade conference there and found it lacking. It is certainly fair to say that Reno and the Peppermill will be tested in earnest next March. If that test amounts to "be better than Bally's," Reno will probably do okay. At the end of the day, it's about your quality of life and whether your investment capital is doing the job you sent it out to do. DSG has posted phenomenal gross growth since its inception, never taking a loss year-over-year, but our net has been less impressive as we weathered the storms of departing partners and aggressive competitors at the same time as the industry travails everyone else had to endure, such as Crystal Commerce's "Red October." A one-owner-one-operator shop that posts decent net can absolutely provide a quality of life worth engaging. A megastore with economy of scale can do the same. A chain can work wizardry from load-balancing to calendar optimization and has the kind of brand reach that gets more for its money than any single specialty store. The odd store out in this mix is the "Mario," which until the end of 2016 is what DSG Gilbert was. A little bit good at everything, but not dominant at anything. I definitely have work to do. And if I can't see the kind of net income that DSG ought to be able to produce, I'll go into a healthy-margin business elsewhere, whether carpet cleaning or cabinetry or what have you. Meanwhile, people like to throw gross figures around, and I am no exception. My grosses are pretty damned impressive. I would give back a meaningful chunk of them if it meant better performance pound-for-pound. Always remember, butts in seats still have to be monetized. I can do without Bally's for the rest of my life, I think. I don't know that it's especially worse than other Vegas megahotels, but I also don't think it does anything so much better that it would make me go out of my way to go back. It is difficult to get to the parking garage regularly, not an issue for those who traveled by air but a bother for when I had somewhere to be. Everything at Bally's is expensive and a generation out of date. It sufficed and I have some memories, but that's past and now I'll move on to the future. It will be a bummer not to visit Little Shop of Magic, Wii Play Games, or any of the other Vegas game stores next March, but I find myself in Las Vegas on some pretense every year, so I am sure I will drop by. I still need to hit up Darkside Games and out of curiosity at the spectacle I may drop in on the Gaming Goat. I missed the Pinball Hall of Fame this time, much disappointment, only to learn that it was closed or something? Renovations or repairs? The moose out front should have told me. Maybe by the time I head back, Interstate 11 will finally exist. We can hope.